Match Pointer scoreboards are made from uPVC, a very durable, all-weather and UV proof material, perfect for long-lasting indoor and outdoor use. 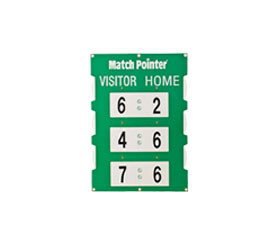 Match Pointer tennis scoreboards come in 3 sizes, all easily portable, with a variety of hook and stand options to allow for a range of display heights. Match Pointer provides exceptional quality, outstanding service and a versatile product, all at a very competitive price! 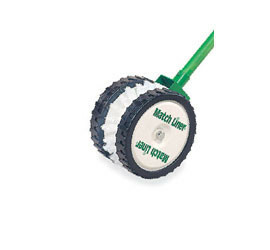 Match Liner is a unique line brush designed for use on clay court surfaces. It is very competitively priced, low-maintenance and lightweight. Match Pointer makes score keeping easy, using an efficient, cost-effective, patented disc design, perfect for club matches and tournaments. 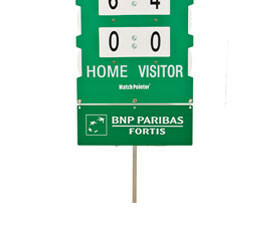 Promote your brand to a targeted audience with tennis scoreboard sponsor advertising. We even offer a free design service.